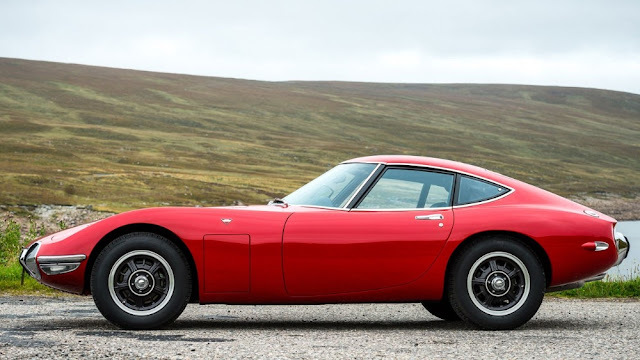 The Toyota 2000GT was designed by Graf Goertz - the NY industrial design firm. So subtle were the lines of its bodywork that manufacturing costs soared. A mere 337 2000GTs were subsequently built - ensuring that the car is now highly sought-after. Though the GT was intended as a loss leader, Toyota no doubt did not expect the losses to be quite as large as they were! That said, when the 2000GT prototype débuted - at the '65 Tokyo Show - Toyota's brand-image sky-rocketed. The 2000GT had speed to match its staggering good looks. The twin-cam straight-six engine developed 150bhp. That gave a top speed of 135mph. The motor's hemi-head set-up featured straight-through ports, and large valves. In other words, it breathed deeply! On the inlet side were two double-throated Mikuni/Solex carbs. There were also a five-speed 'box, disc brakes all round, and a backbone chassis with a full set of wishbones. There were options for the final drive ratio, too. Crucially, the 2000GT failed to crack the States. A mere 63 Americans saw fit to buy one! That was in large part down to its hefty price tag - at least, as compared with its rivals. It exceeded that of the Porsche 911 - and Jaguar E-Type - by a considerable margin. And, arguably, they were better cars! Toyota went on to produce no less than nine more conservative versions of the GT - in a desperate bid to woo the American market. They came complete with air conditioning, and optional auto transmission. It did not work! Elsewhere, however, the Toyota 2000GT - along with the Datsun 240Z - was a clear signal to the sports car world that the Japanese were coming!